With over 30 years of experience of handling various types of personal injury cases throughout central Florida, Rue & Ziffra is dedicated to helping families recover from the emotional, physical and financial stress associated with their case. 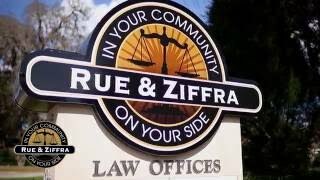 The accident attorneys at Rue & Ziffra are in your community and on your side. Our experienced and dedicated firm proudly serves various areas throughout Volusia County, including Port Orange, Daytona Beach, New Smyrna Beach, Edgewater, Ormond Beach, Palm Coast, DeLand, Deltona, Orange City, DeBary, Enterprise, Bunnell, Sanford and Orlando, Florida. Select case type... Airplane Crash Litigation Animal Law Automobile Accidents Aviation Law Dog Bites Employee Benefits ERISA Health Care Hospital Law Insurance Litigation Medical Malpractice Military Law Motorcycle Accidents Negligence Nursing Home Litigation Personal Injury Premises Liability Products Liability Slip and Fall Social Security Social Security Disability Transportation Trucking Accidents Veterans Benefits Workers Compensation Wrongful Death Other Case type is required.